Where Have All the Homes Gone For First Time Home Buyers in Reno? The past couple weeks have been a bit of a struggle for many of my first time home buyers. An increase in the numbers of buyer’s coming into the market and the passing of AB284 in 2011� have created pretty fierce competition. Many homes that are priced right and in good condition are procuring multiple offers and selling for more than list price. Where does that leave us…? In a market with a lack of inventory that is bordering a seller’s market. The last RSAR figure was that our market has 5.9 months of inventory or about an equal share of seller’s market and buyer’s market. This is the second lowest number since 2005. 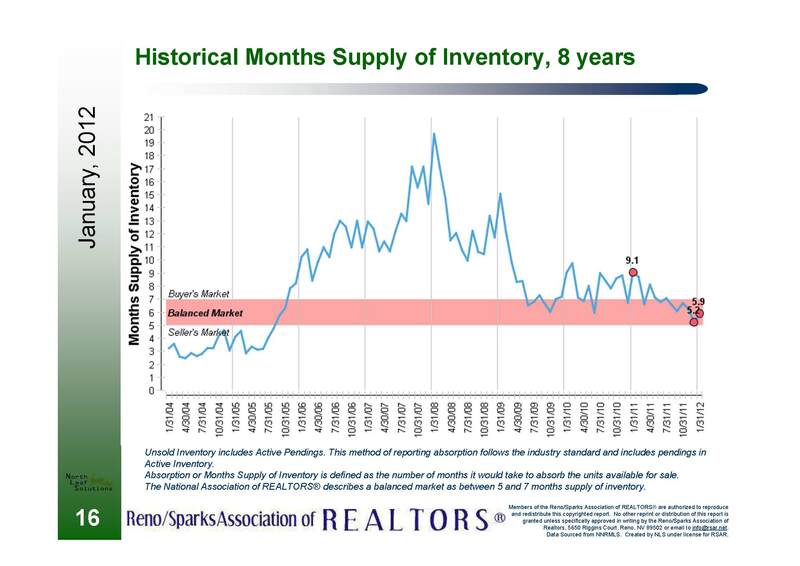 Click on the graph below to see the historical inventory level for Reno/Sparks. For a list of� homes that are still available click on the map below. For more information on buying a home in Reno or Sparks, NV feel free to contact me at (775) 750-1437 or Ricky@Resnv.com. Posted in For Buyers, Market Update and tagged AB284 nevada foreclosure law, cheap reno homes, reno buyer's broker, reno buyers agent, reno first time home buyer loans, reno first time home buyer tips, reno home inventory levels.